MILAN - Italian fashion house Bottega Veneta had Hollywood star Lauren Hutton bobbing her head to hip-hop on Saturday as it showed off a playful, nightclub-ready collection heavy on jewels, mirrors and fringe. The venerable Venetian outfit transformed a warren of rooms and halls at the 19th century Palazzo Archinto -- now a school -- into a sprawling runway at Milan fashion week. The co-ed Spring/Summer 2018 collection featured airy shirt-dresses, fringe strung with tiny glass beads and several slinky floor-length dresses covered in rhinestones. Kardashian mum Kris Jenner was front and centre, watching her daughter Kendall pass in a geometric-pattern swimsuit and shiny trench coat. Superstar Bella Hadid was on the runway too, after shows for Fendi and Moschino. Bottega regular Hutton -- who famously sported a red leather Bottega purse when she starred alongside Richard Gere in "American Gigolo" -- sat in the front row tapping her toe and nodding along with the booming sounds of rapper 50 Cent's 2003 smash "In Da Club". "It's all these easy pieces," Bottega's long-time creative lead Tomas Maier said in his design notes. "Even the long dresses are like T-shirts." The women's silhouettes were clean and utilitarian, but there was tonnes of embellishment -- with tiny round mirrors, exotic skins like anaconda and metal eyelets of varying sizes. Designs for the fellas were sporty but sharp, including dapper tapered trousers and pointy shoes. Materials like antique satin, suede and cotton pique ruled the day. "It makes for a very precise silhouette," Maier's notes said. 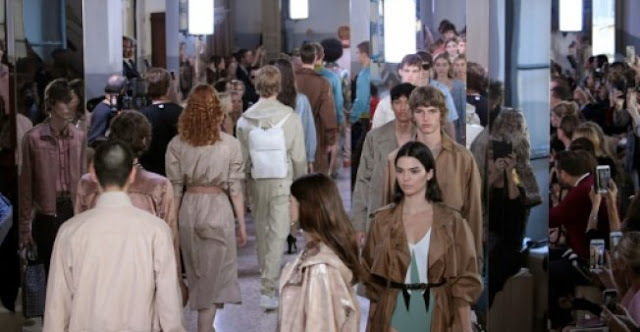 Now owned by French conglomerate Kering, which also has Gucci in its stable of luxury brands, Bottega Veneta was founded in 1966 by Michele Taddei and Renzo Zengiaro. The fashion circus in Milan continues Saturday with big shows from Missoni, Salvatore Ferragamo and the first Milan outing for Luke and Lucie Meier since taking creative lead at Jil Sander. Italian fashion house Bottega Veneta had Hollywood star Lauren Hutton bobbing her head to hip-hop on Saturday as it showed off a playful, nightclub-ready collection heavy on jewels, mirrors and fringe.